We anticipate that accommodation will be at a premium for this event; please consider sharing a room with friends, booking a bed in a shared dorm, or bringing a campervan/camping if you're an outdoor type! Not only will you save yourself some cash, but it will mean that more people can join the party! 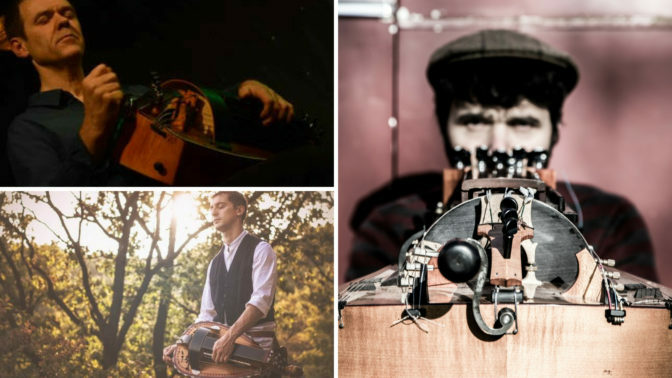 Guaranteed to be one of Halsway’s noisiest weekends, this Hurdy-Gurdy takeover is a brilliant opportunity to get together with some of the best of Europe’s players in an intensive learning weekend of masterclasses, workshops, sessions and a Saturday night concert/dance. This course runs alongside the Bagpipes Weekend, in a frenzy of reeds, drones and buzzing things! Early booking advised. The weekend is hosted by Claire Dugué, hurdy-gurdy maker and repairer, and she’ll be available to help people get the most out of their instruments with tips for maintenance. She is joined by an elite tutor team of Gilles Chabenat (France), Francesco Giusta (Italy) and Joel Turk (UK)! Gilles & Francesco will work with Intermediate & Advanced level students; Joel will work with beginners. For an extra £35, participants can stay until Monday morning, including supper and B&B. Please enquire when booking. This course will be for players of the hurdy-gurdy of all ages (under 16s must be accompanied by an adult) and abilities! Claire Dugué, a native of France, encountered the hurdy-gurdy in London during her college training as an instrument maker. She was captivated by the instrument and has been making hurdy-gurdies ever since, producing quality instrument for amateur and professionals alike. Claire has now taken over the organisation of the weekend from Paul James and will be hosting the event and be also at hand to help with the technical aspects of setup and maintenance. Gilles Chabenat is regarded as one of the very best hurdy-gurdy players of his generation. He began playing the hurdy-gurdy at 13 with Les Thiaulins, an association devoted to folk arts and traditions. Following private lessons with Georges Simon, he won several music awards and subsequently devoted himself to his region’s traditional repertoire with a desire to branch out into other musical styles. In the wake of Valentin Clastrier, he thus felt the need to reinvent the instrument and the playing techniques associated with it. Around that time and after several years of research, luthier Denis Siorat developed a contemporary-style electro-acoustic instrument which facilitated the integration of the hurdy-gurdy into the modern musical experience. In 1992, Gilles Chabenat began a twelve-year partnership with the Corsican group I Muvrini. During that period, he met and worked with a number of renowned artists: Véronique Sanson, Stephan Eicher, Jean-Jacques Goldman, Sting, as well as Frédéric Paris, Edouard Papazian, Alain Bonnin, and Gabriel Yacoub to name but a few. More recently, he has been collaborating with jazz musicians and also works regularly with Eric Montbel, Didier François, a Nyckelharpa player, Gabriel Yacoub and Patrick Bouffard. Gilles’ musical experience and evolution are thus constantly shaped by the people he meets. In his approach to hurdy-gurdy playing, he draws essentially on the multifaceted nature of an instrument which has been in constant evolution for more than one thousand years. Francesco Giusta (Italy) started to play hurdy gurdy at the age of 11 with local tutors before developing his technique with some masters of the instrument; J F Maxou Heintzen, P Bouffard, G Jolivet, G Diaz, T Nouant, S Durand and V Clastrier. Within the years he has played in several bands, mostly in folk and medieval music performing at many folk and medieval festivals in Italy and France; worked with Lou Dalfin and in some musical project with Sergio Berardo. He recorded some CD’s (‘En l’aire ailamont’ in 2011 and ‘Podre’ in 2013 with La Mesquia, ‘Balfolk’ in 2014 with Trigomigo) and was a guest in ‘Bon Nadal Occitania’ in 2009, with Sergio Berardo, ‘Cavalier Faidit’ in 2011 with Lou Dalfin, ‘Santulubbiranti’ in 2015 with Malanova. Since 2011 he has been giving masterclasses in Germany and regular lessons in Turin. In 2015 he won the first price at the hurdygurdy challenge at ‘Le son continue’ festival in Chateaux d’Ars, France. He now plays with Trigomigo, Controcanto, Bal là and has regular hurdygurdy classes in Turin and Cuneo. Joel Turk is one of our regulars at Halsway Manor, as he has been teaching hurdy-gurdy to the most advanced players over the past 2 years. He is back this year to look after the beginners! Joel is well known for being a member of the great band Red Dog Green Dog.